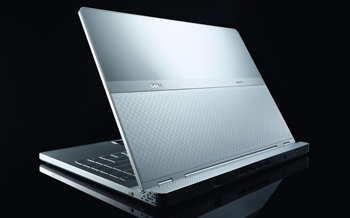 Dell launched its sleek and fashionable Adamo laptop line Tuesday one of the most buzzed laptops of the year. Going head to head with Apple’s MacBook Air and HP’s Voodoo Envy, Dell’s Adamo line aims spruce up Dell’s boxy image by bringing laptop design sensibility to fashion conscious users willing to compromise processing power over a thin beautiful exterior. Dell’s Adamo will be available from March 26. Pre-ordering started on Tuesday. Dell claims its Adamo line of laptops is the thinnest in the world, with a uniform thickness of 0.65 inch (the MacBook Air is 0.76-inch at its thickest point and HP’s Voodoo Envy measures 0.7-inch). The laptop’s light and ultraslim design makes it easy to hold it with a few fingers. It weighs around four pounds, with a 13.4-in. screen. The Adamo laptops are built from aluminum (with a unibody design, a-la MacBook Air) and will come in two colors — onyx and pearl (or black and white for you and me). The LED backlit glossy widescreen (16:9) display with a 1,366 x 768 resolution is housed behind a sheet of edge-to edge glass (previously seen in Apple’s new MacBook line). Adamo laptops will come with Windows Vista Home Premium (SP1, 64-bit) pre-installed. On the inside, Adamo sports at Intel Core 2 Duo 1.2GHz processor (MacBook Air has a 1.86GHz chip), a 128GB SSD (solid state disk) and comes with 2GB of RAM — all weighing four pounds (a pound more than Apple’s counterpart). Just like Apple’s skinny model, Adamo doesn’t come with a built-in optical drive but a separate external (fashionably color matched DVD+/-R or Blu-ray) drive will be available and also 250/500 GB external HDDs. As for connectivity, Adamo features two USB ports, one USB/eSATA port (used for connecting the external optical drive/HDD), an Ethernet jack and a DisplayPort video output. An interesting addition is a SIM card slot on the right side of the laptop, next to the headphone jack (which can be used for connecting to the Internet over high-speed wireless networks). WiFi (including Draft N) and Bluetooth 2.1 are on board as well. With prices starting at around $2,000, it isn’t targeted at normal buyers, said John New, senior product marketing manager at Dell. The laptop uses new technologies that could make it a speedy machine – it runs on an ultra-low-power Intel processor, supports DDR3 memory and includes SSD storage. 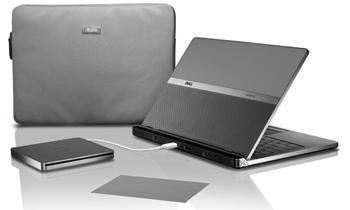 A battery built inside the laptop provides about four to five hours of runtime per charge. Speculation around Adamo heated up late last year when observers suggested Dell was building a laptop as a response to Apple’s MacBook Air. The rumour was confirmed when the laptop was shown to the press at the International CES in January. Dell did not reveal its specifications at the time, saying Adamo was being shown to squash impending rumors about its existence. Adamo is heavier and may be bigger than the MacBook Air, but it provides Dell an entrance into the ultraportable market to compete with offerings such as Hewlett-Packard Co.’s Voodoo Envy. In particular, Dell could face an uphill battle against Apple, which has a leg up with impressive designs and a loyal customer base that allows it to charge a premium for products. Taking a veiled jab at Apple, Dell’s New said that Adamo sacrificed size to bring more practical functionality — like the inclusion of an Ethernet port — rather than skimp on finer details. Apple has been criticized for not including an Ethernet port in the MacBook Air. Dell has a history of fairly boring designs, but the PC maker has been aggressive about changing that, said Stephen Baker, vice president of industry analysis at market research firm The NPD Group Inc.
“While not everything has been a success, I think their colors and patterns on notebooks have resonated well, and they have been steadily improving the design appeal of their products,” Baker said. But as consumers cut back on spending during the recession, will anyone pay a premium for the laptop? Adamo could do fairly well with affluent buyers who continue to spend on hardware and technology products, but it has to be positioned and marketed correctly, Baker said. “People will spend [on Adamo]. This is not intended to be a high-volume, high-velocity item but more of a statement [product],” he said. Prices for the laptop start at $1,999 with a 128GB SSD and an Intel Core 2 Duo SU9300 ultralow-voltage processor running at 1.2 GHz with 2GB of DDR3 memory. The high-end version of Adamo is priced $2,699, with an Intel Core 2 Duo SU9400 ultralow-voltage processor running at 1.4 GHz with 4GB of DDR3 memory. 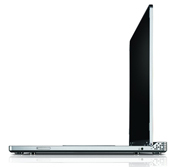 The laptops include 128GB SSDs for data storage and run on 64-bit Windows Vista. Networking options include an Ethernet port and wireless 802.11n networking. Dell does not include an optical drive in the Adamo, but it is offering external DVD-RW and Blu-ray drives and external hard drives with storage capacities of 250GB and 500GB. Users will have to send their laptops to a depot to replace internal batteries, New said. He couldn’t predict how many days a user would have to wait to get the laptop back after a battery replacement. The laptop is available worldwide starting Tuesday from the Adamo Web site.